At every Vans Warped Tour show, I see something unusual. 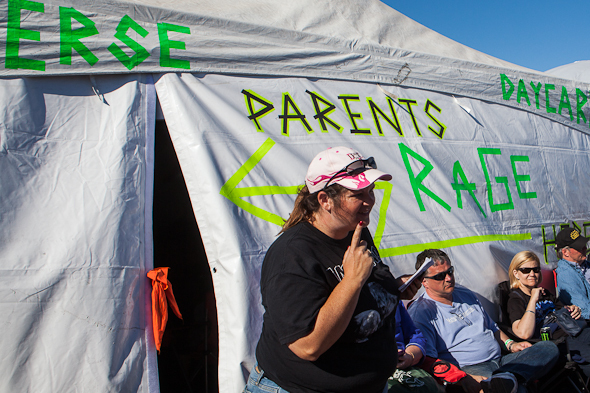 In San Francisco this year, I saw a tent called “Reverse Daycare.” Parents gathered in the area while their children attended the concert. The tent was a great idea, but I always passed quickly, afraid that some magical force might pull me into the space reserved for old folks. Usually, being a parent is comforting, but not at a concert. 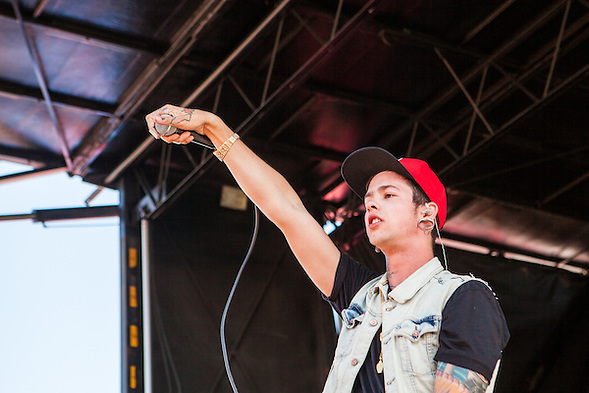 When I photographed California rapper T. Mills, I wondered if should have been in the parent tent. 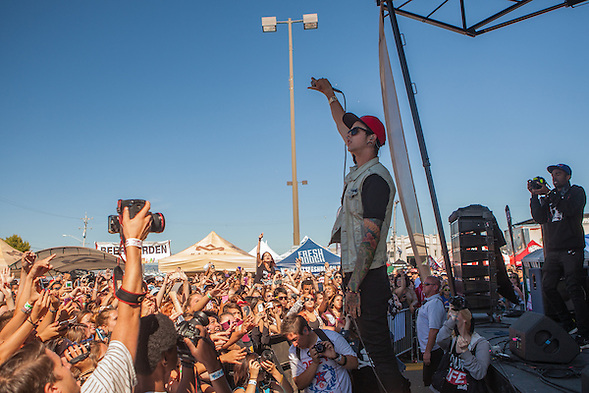 T. Mills’ lyrics could be considered degrading to women, except nearly all of his fans are female. The young women cheered wildly, many singing along to all the songs. I probably enjoyed his performance more than I would have enjoyed being in the parent tent, but I was also grateful that I could only photograph three songs. That is about my limit for any band these days. Today T. Mills released his new digital mixed tape Thrillionaire. This entry was posted on Monday, July 9th, 2012 at 11:03 pm. It is filed under Music Photography and tagged with concert. You can follow any responses to this entry through the RSS 2.0 feed. I actually find the “parent tent” a great idea. I know that at least nine of my friends will be going to Warped Tour this summer and each of them had to make some sort of compromise with their parents regarding safety and their parents’ presence. Many teens also don’t have means of transportation aside from their parents, so the parent tents provide a measure of convenience for both teens who don’t want to be stuck with chaperones throughout the concerts and their parents who most likely find less interest in the concerts themselves than in the safety of their kids. The parent tents additionally bring people in similar situations together. I should probably distribute this post to a wider audience and see the reaction. After reading your post, I wish I had traveled with the tour and stayed with the parent tent a little longer. Perhaps next year I can go to a few shows and hang out with the other parents. I do not remember seeing the parent tent the first two years, but maybe I was not looking. I am also guessing that the parents had a great time. Have you seen parent tents at other concerts?